Developer Crescent Heights is once again proposing to build a tall, Arquitectonica-designed condo tower at 500 Alton Road. It would replace an approved plan to build a much shorter apartment project, ranging in height from 5 to 7 stories. The maximum height limit for the area is 75 feet (or about 7 stories) under the city’s zoning code. The South Shore Hospital building being used as leverage to obtain higher intensity for the site has been retained by the developer as a vacant eyesore for over a decade, directly at the main entrance to South Beach. A meeting with neighbors is scheduled for Tuesday, April 3, 2018 at 6:30 PM at the Mondrian Hotel. Build something. Anything. …Or at least reopen the 7 Eleven. Let it serve a purpose…anything that removes the illegally paved and striped parking lot these guys Created under the cover of night a couple years ago. Yeah, why is the lot still there? But, please, do no rush and allow them to build anything. Anything other than the current maximum allowed would be a travesty and set a terrible precedent. I disagree. This is a billionaire developer who has shown he is willing to wait this project out. Nothing – absolutely nothing – can be worse than what the site currently is. A dead body has been dumped there, a zika breeding ground, swat team officers have chased armed suspects into the empty building. A compromise must be made, with high priority in getting something started ASAP. He’s more than free to build by-right. I can almost guarantee that the wheels have been greased in terms of campaign contributions for this to get approved very soon. What other reason would they propose it again knowing it had a horrific reputation in the previous round. Yes, the current beach leadership is pro car-centric development. This project adds a new lane to Alton Road, it should be a shoe-in. Sad, but in order to combat morons, it takes a top down approach. It is predictable…some lady likes that there is dead space for a decade because her cats are used to that. Some radical with an Intelligence Quotient of 81 has some personal hang-up with “cars”. And there is always a NIMBY that arrived in 2012 and hates the “over-development”. Private property rights should be respected. I agree. I live near by and I say out with the old and in with the new. A few months ago I watched a Miami Vice rerun and was shocked to see that this lot had always been empty, even going back to the 80’s! current beach leadership has no vision. The Beach Leadership has a terrific vision for a Utopian Paradise (as long as the Bureaucrats are recognized financially and ceremonially as the leaders of this Utopia). If, for instance, they have a financial interest in a Sunset Harbour retail/Parking garage garage they have “vision”. That “vision” is to elevate the sidewalk to match their retail property, and not the neighbors retail property. They will say that is necessary for Sea Level rise or something. Nice vision. First things first, knock that nasty skeleton of a hospital down and in it’s place build a Metro or Metromover station, I don’t care which, either one will be fine. Then, build a 50 story building. Are they still including the transit hub that was proposed in the previous design? Please NOT another Arquitectonica design! Let an up-and-coming, competent Architecture take on the task! I guarantee you’ll pay less in fees, and end up with some truly unique to add to the SoBe skyline. All too often we hear the same architects designing new projects, when in reality they are simply copy-paste of their old projects — nothing new or inventive! Crescent Heights is known to be visionaries! 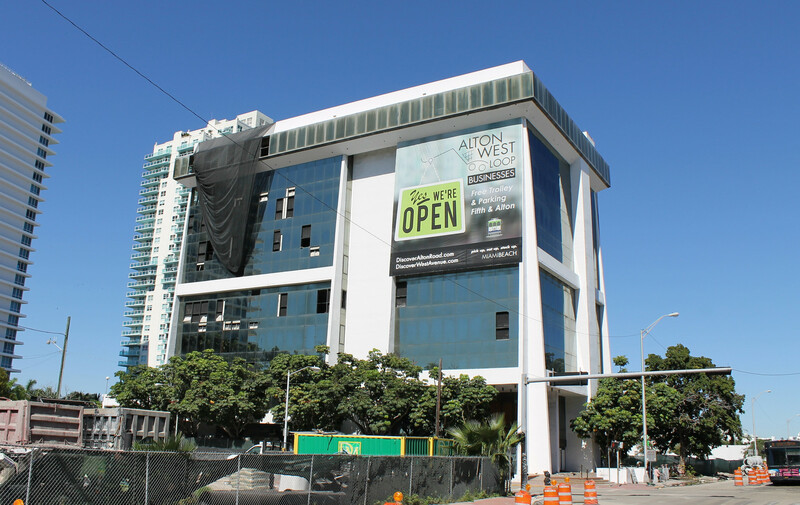 Let’s bring in something new to Miami and not the same glass boxes that ARQ always does… boring. 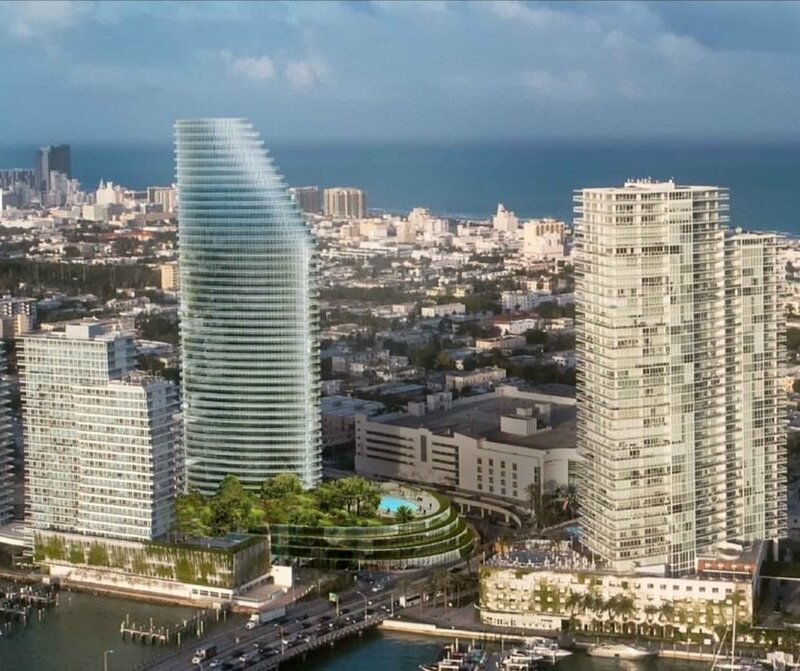 Well their School Board site proposal across the bay is same old hideousness, so I beg to differ concerning Miami. So you reference 1 site they own and that’s it? Weak argument IMO. But here’s their breathe of work, for your convenience I have copied a link here below — go ahead and educate yourself up on them. Then perhaps you can gain some vision of your own. Forget it, it ain’t happening. Just concentrate on building the towers you’re proposing in mainland Miami Crescent Heights. How about build within the confines of the zoning. The low-height buildings fit perfectly with the scale of Miami Beach. Also, reading the linked article, they want to widen Alton Road? Sorry, but you can’t build your way out of congestion. We need alternatives to the automobile on the beach. While the 50 story may sound terrible for traffic impact (about 100 condos) imagine what will bring the “as-of-right” 75’ high buildings going horizontal, no park donated and now 400 co do units instead of 100 condos. That’s 4x more the cars. Also the units would sell for far less than – lower end – than if it were only 100 ultra high end condos. Not only is it much less traffic impact but will help raise valued to the neighbors. Arquitectonica designed something that isn’t a box with ugly cladding? Madness! If Crescent Heights can’t develop this tower here, recycle it for the School Board site across the bay. this will be the beginning of the death of South Beach, Manhattanizing it will kill the character and charm of the coty, just lt is doing in NYC. Greed and megalomania.